Just finished @gerrymcgovern 's 'Transform' – feeling inspired ???????? but also daunted at the thought of trying to transform this rigid org. ???????? Are you an optimist? Are you a rebel? Do you think that because of digital technology, power is shifting away from organizations towards citizens and customers? Are you a digital change agent? Do you want to transform your organization? 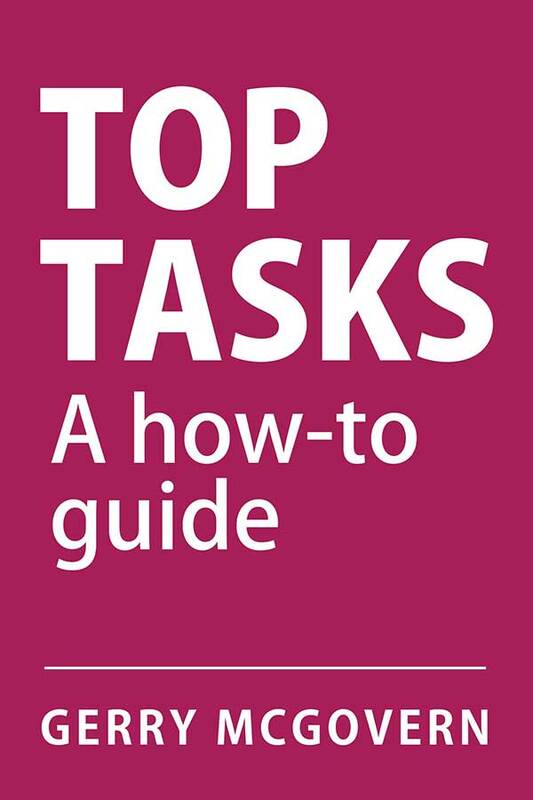 Then this book is here to help you. Do you want to transform the complex into the simple? Do you like challenges and see yourself primarily as a problem solver? Are you the annoying person who constantly asks: “Why?” Are you empathetic? Do you like to listen, watch, observe? Are you also rational? Are you willing to go with the evidence and data, even when it goes against your gut instinct? Transform is for customer champions and advocates because the essence of digital transformation is about moving from organization-centric to customer-centric. Power has shifted. Customers are much more powerful today. Thus, becoming truly, obsessively customer-centric is the most radical, transformative thing you can do. Transform is about a new customer-centric model of thinking and management. It offers a customer-centric philosophy and approach. It gives you the evidence for why the old model simply isn’t working anymore. It gives you a new management model which is founded in customer outcomes. If you’ve been doing this customer-centricity stuff for a while, then you’ll know that your lot is not always an easy one. Yes, most organizations like to talk about customer-centricity, but they rarely practice what they preach. Because the old model of organization-centricity with its silos and its egos used to be much more comfortable and profitable. Until now. The stuff in this book is risky—there’s no point in pretending otherwise. It’s about a new model. The old model—the old hierarchy—will not roll over easily. There will be resistance, and unfortunately the most dangerous element of that resistance is likely to come from senior management. Because old model senior management is over-rated, over-paid and underperforming when it comes to leading the necessary transformation that must occur. I met David Shaw around 2009 when he was editor for the Scottish Enterprise website. (An organization focused on supporting Scottish entrepreneurs.) Like many other website managers, he was frustrated with his job. He told me about how different it was to his previous job as editor manager of Scottish Fishing Weekly, a very successful print magazine. When he was editor there, he was four days of the week on the road. He was out with the fishermen and only came into the office on Fridays. He knew his audience inside out and focused relentlessly on the issues that were important to them. As editor of the Scottish Enterprise website, he spent five days a week in the office doing “digital” stuff and hardly ever met or communicated with a customer. He had become what I call a “put-it-upper” (derives from the Latin “put-it-uppo”). He launched stuff, published stuff, put stuff up on the website because someone somewhere else in the organization said to put it up. David knew that this was not the right thing to do. The website was growing fast and had lots of outdated information that nobody wanted to review or remove. But he didn’t have the hard evidence because he wasn’t in touch with his customers. I was in contact with David recently and he said to me this: “Still fighting the good fight! I’ve always been the troublemaking ‘what about the customer’ guy and must say it has been career limiting.” Career limiting? Yes, up until now most customer champions had very little chance of progressing up the management hierarchy. But things are changing. The customer champion has a very bright future to look forward to, though there are certainly risks involved. This is a time of revolution and revolutions are dangerous times. Many hierarchies hate the fact that customers have more power, and they resent those employees who are the voice of the customer. (The fact that, deep down, they know you’re right doesn’t mean they’ll dislike you any less.) Many organizations simply do not have enough will to make the painful change from organization-centric to customer-centric. They will wither as the new model blossoms. You will switch jobs a lot of times during your career and you’ll switch brands even more as a customer. It’s just the nature of digital: fluid, dynamic, rapidly evolving. So, you will need to be able to evaluate whether the organization that you are currently working with has the capacity or willingness to change. One of the best possible tests of digital readiness is “switchability”. The more old-model the organization is the harder they try to make it for customers to switch. New model organizations empower customers with information and strive to make everything as simple as possible. So, one of the greatest things you can do in order to help the new model to thrive is to design the switches. Design the things that give control to the customer, that allow them to easily compare and switch, that allow them to connect, collaborate and share with their peers, that allow them to understand what they need to know in the fastest, simplest possible manner. Transform gives you a new management model that is centered in the world of the customer, rather than the world of the organizational silo. Is your organization flexible, nimble and ready to adapt, or is it rigid, hierarchical and slow to change? Should you stay or should you go? 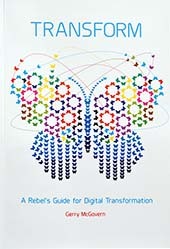 And if it’s somewhere in-between, as most organizations are, Transform will give you a method, a way of thinking, a model by which you can contribute to the digital transformation that must occur in order to be fit for survival in this new model.